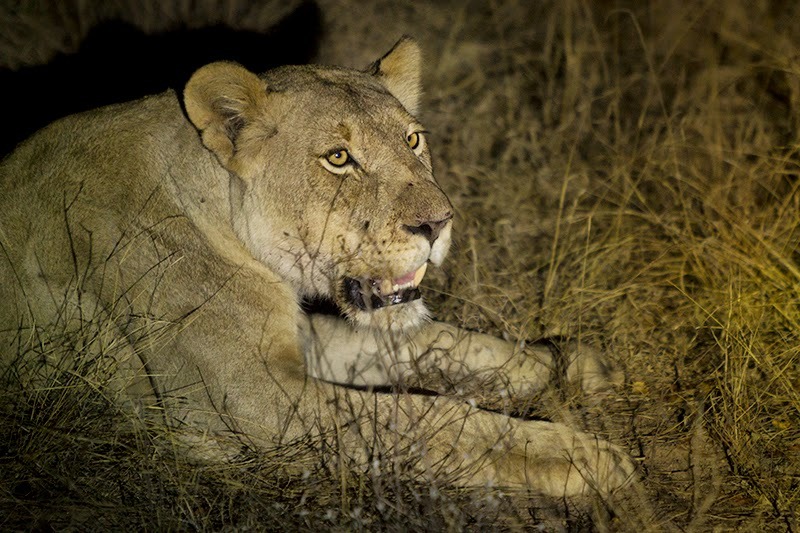 The Lion: the epitome of any safari and usually the top of the list for anyone venturing into deepest darkest Africa. The students at Karongwe are here to learn how to guide; to understand the inter-connectivity of everything on this wondrous planet, from the bedrock that shapes our world, to the birds soaring thousands of feet above our head, but where possible, a big game sighting is always welcomed! The radio crackled to life. Lions. Kill. Feeding. The words that everyone wants to hear. Anticipation reached fever pitch as we turned on the ‘two track’ as the light began to fade and we started to twist our way into the depths of the bush. 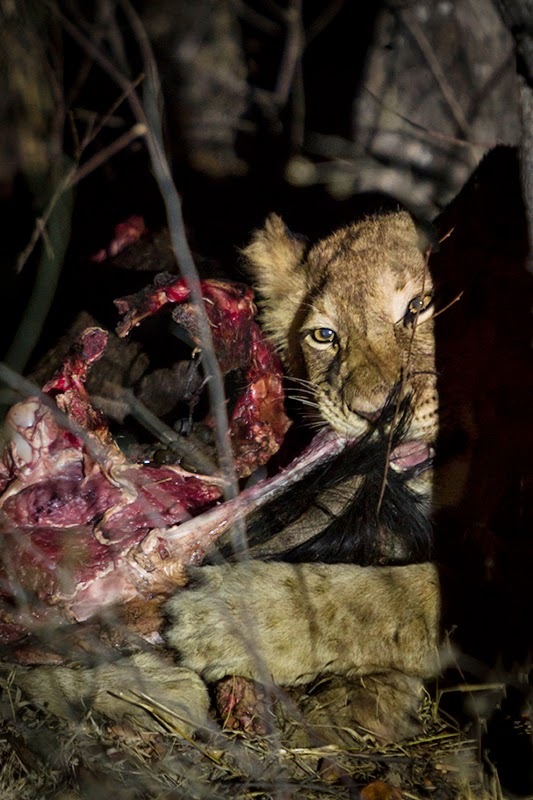 The private world of a lion pride was soon revealed to the future generation of guides as we rounded a bend and came face to face with 4 sub adults busily dismantling what was left of a blue wildebeest. 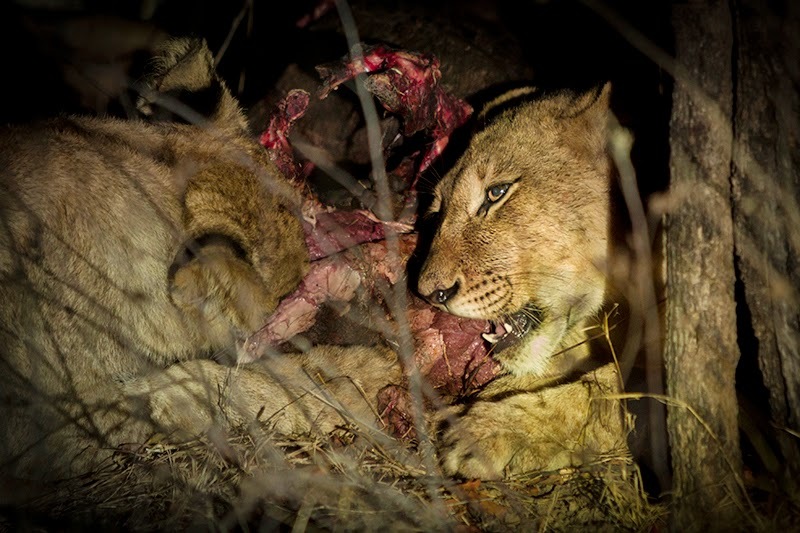 Two rather obese looking lionesses lay close by, panting heavily to get the necessary oxygen to aid in digesting the gargantuan amount of meat that was sitting heavily in the swollen bellies. No one spoke as we listened to the razor sharp carnassial teeth of the young lions slice through flesh, muscle and sinew; the scene illuminated by the spotlight like actors on a stage. To some, the scene seemed gruesome, to others it was a sight that they had hoped for since their course was booked. Whatever the interpretation, nothing changes the fact that out in the wild, this is life. Its kill or be killed. The wildebeest’s demise was unfortunate, but its sacrifice will ensure that the lion pride of Karongwe will not go hungry, and that the next generation will be able to develop into mature adults. What we were witnessing was a perfect example of the recycling and sharing of nutrients in the wild. Out here, nothing is wasted. Energy cannot be created or destroyed, only its path altered. This is one of the cruxes of ecology and the students were given a first-hand insight into the perfect design of the natural world. Cameras flashed and students barked questions regarding the diet, pride dynamics and habits of one of the world’s most iconic predators. I did my best to field the questions but felt like a cricketer in the firing line of 9 of the world’s best fast bowlers! As darkness descended around us, the other vehicles came and went until we were alone with the scene. Nature has a dramatic streak however, and seemingly on cue, decided to augment our experience. The clouds rolled in, tongues of fork lighting lit up the air and ominous thunder reverberated in the distance. Nature’s drama was complete. We left the pride to their meal, heading home at a reasonable pace to seek shelter before the heavens above us opened in the first proper thunder storm of the season. The drive back was an adventure itself with the surrounding area being regularly lit by bolts of brilliant light dancing across the sky. As every strike snaked its way through the heavens, the land rover was filled with ooohs and aaahs, just like a crowd at a firework display. The sighting had been a good one, but the drive back was epic, putting the meagre power of a pride of lions into perspective as Mother Nature flexed her infinite muscles. What a spectacular way to end a life altering experience for many of the EcoTraining guides-in-training!